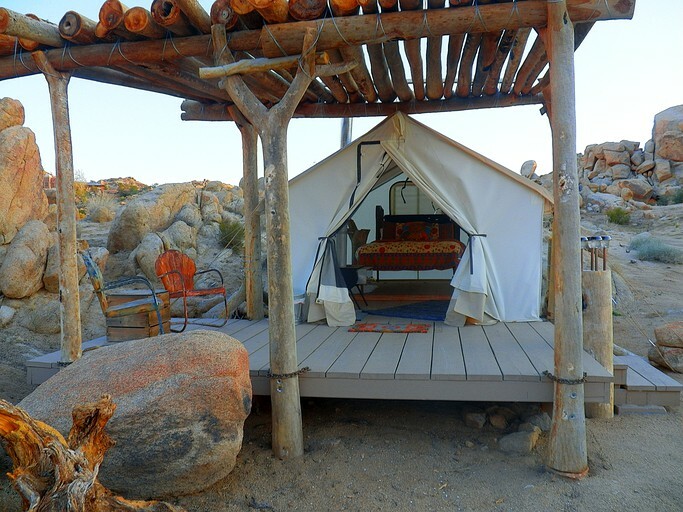 This romantic 10-by-14-foot safari-style tent is nestled in the picturesque desert landscape of California's Yucca Valley near Pioneertown. 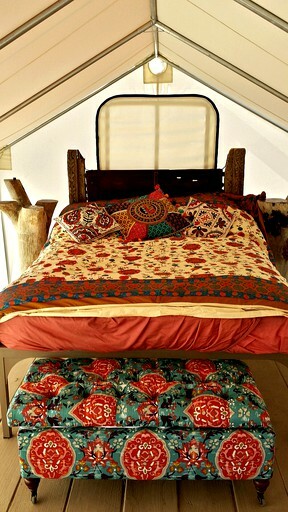 The interior of the tent features a queen-size bed appointed with linens and pillows, a futon chair, Joshua tree nightstands, and a cozy wood-burning stove. There is a bathroom with a toilet, a sink, and a shower just a few steps from the rental. 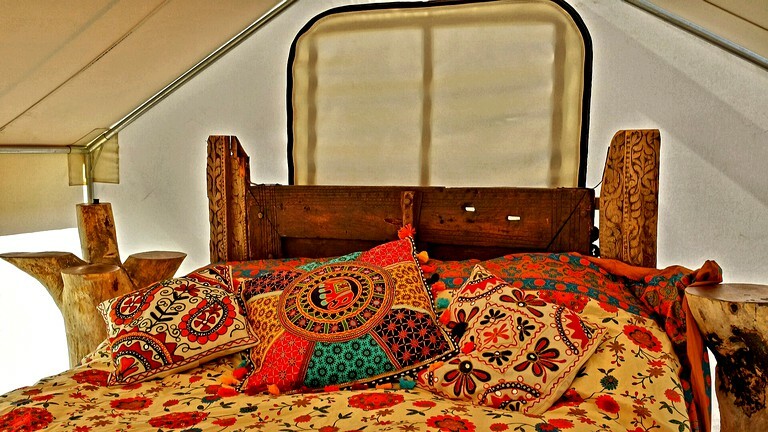 Glampers will be able to experience the rustic Californian wilderness while still enjoying access to modern amenities and conveniences during their stay. The property features fantastic common areas for glampers to use, including a lounge and an outdoor kitchen with a barbecue grill and firewood for cookouts. The lounge has a TV, a sound system, a selection of books and board games, and complimentary Wi-Fi. Additionally, glampers will have full access to Lake Aerie as well as the use of stand-up paddleboards. Certain accommodations also feature a luxurious outdoor spa option. Complimentary yoga and meditation sessions are available upon request. A morning coffee service is provided in the communal lounge. 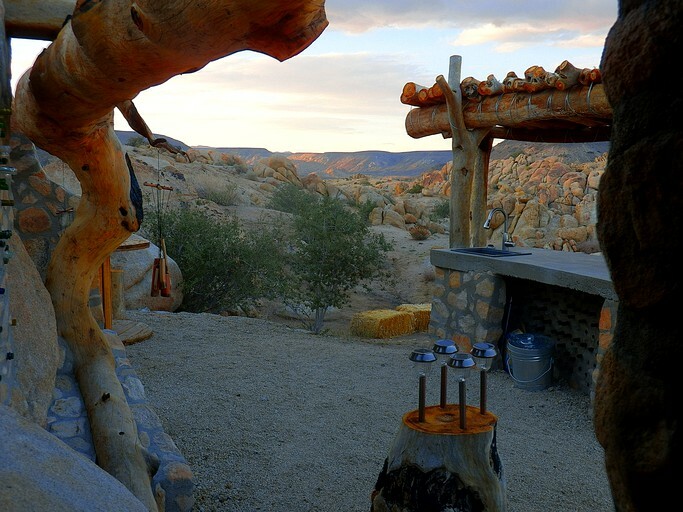 This incredible 40-acre property is located in a stunning high desert setting nestled in hundreds of acres of pristine wildlands in Pioneertown, California. Each unit has been ideally placed to offer convenience to facilities, privacy, and long-uninterrupted vistas. 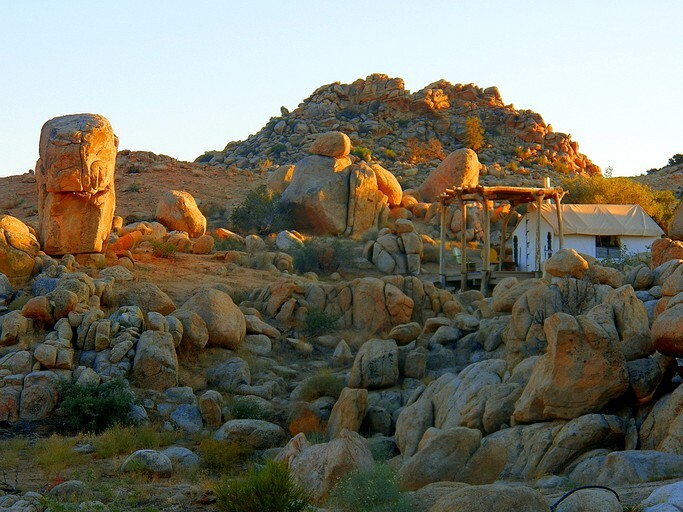 Surrounded by preservation land, mountains, and rock vistas, glampers will be able to enjoy breathtaking views from Mount Gorgonio to the Eastern Mojave. 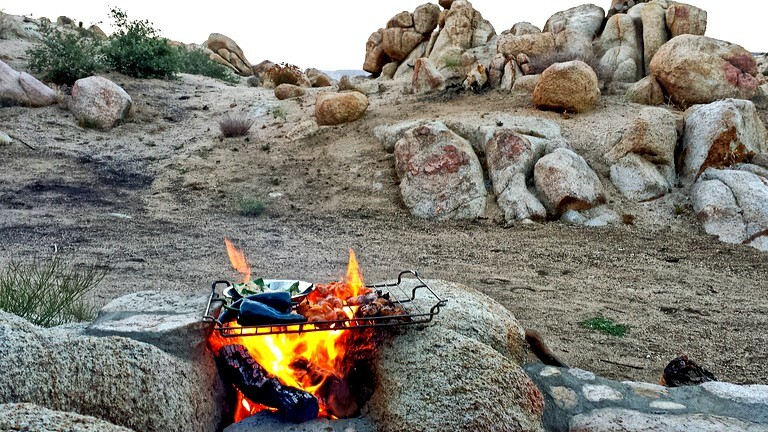 Located just 30 minutes from Palm Spring International Airport at the base of Big Bear (elevation of over 4,250 feet), this is the perfect spot for glampers seeking solitude and privacy. The newly designated Sand to Snow Monument is a short drive, and both Joshua Tree National Park and Big Morongo Canyon Preserve can be reached in half an hour by car. The serene waters of Lake Aerie are just a short hike away and offer an ideal setting for meditation and yoga on land or on SUPaddleboards. 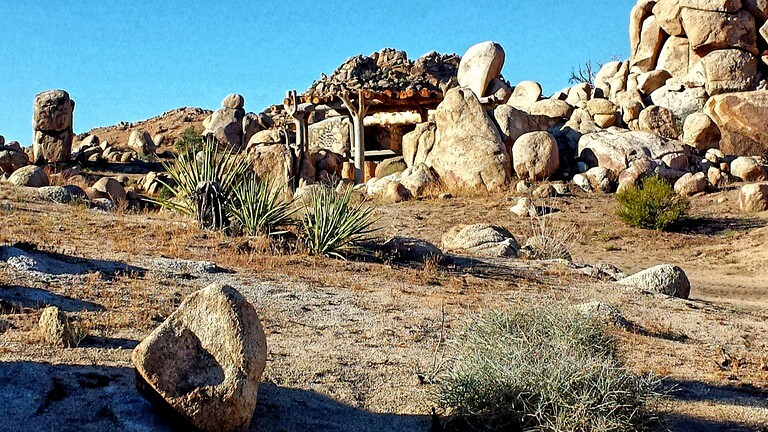 With such close proximity to the Yucca Valley's abundant natural wonders, glampers will have a wealth of nature activities to experience together. 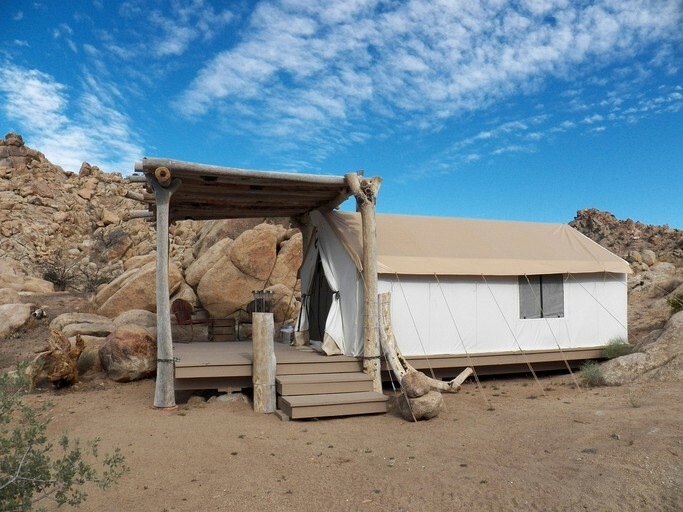 At the magnificent nearby Joshua Tree National Park, glampers will find endless outdoor adventure such as hiking and mountain biking through the park's awe-inspiring valleys. The region is home to hundreds of miles of scenic nature trails for glampers to explore together. Glampers will also have direct access to Lake Aerie, where they can enjoy water sports such as paddleboarding, swimming, fishing, and canoeing. Old Hollywood comes alive in Pioneertown, which is a unique area modeled after old Western film sets. There, glampers can step back in time and listen to live music or enjoy a homestyle meal cooked on an outdoor mesquite wood grill. For a break from California's rustic side, glampers take a day trip to visit the hot springs, luxurious day spas, restaurants, and boutiques in the popular city of Palm Springs. The city also offers museums, a zoo, and an aerial tramway. With access to both the wilderness and the city, there is something close by for everyone to enjoy. The property is in a wilderness area with multiple risks to dogs of any size. Pets are welcome at the property if guests are confident pets can be kept in sight at all times.